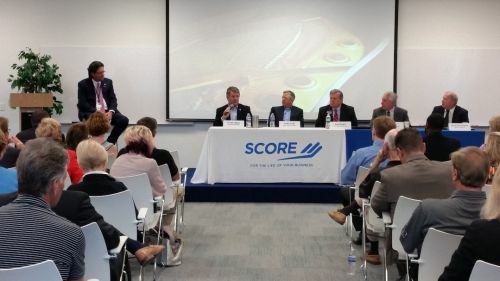 The Naples Daily News, in partnership with the Naples Chapter of SCORE, a volunteer organization that provides counseling to small businesses, conducted a panel discussion among some of the area’s most prominent business leaders. The discussions centered on the outlook for businesses, post Hurricane Irma. While Irma dealt the state a temporary blow, it's back to business as usual according to panelist, Leo Ochs, the Collier County Manager. However, the loss of September revenue, no insurance coverage, or capital reserves for the unexpected will undoubtedly impact some small businesses. Other panelists included Michael Wynn, President of Sunshine Ace Hardware, Blake Gable, CEO of Barron Collier Companies, Dr. Marshall Goodman, CEO of the Naples Accelerator, Jody Hudgins, Senior Vice President of First Florida Integrity Bank, with Bill Barker, Naples News Publisher as moderator. All agreed there are lessons to be learned from Irma. "We have to be better prepared for the next catastrophe because it will happen". The discussions held in the community room of the Naples News were attended by more than 100 persons. It is one of a series of presentations offered to keep the citizens of Collier County and surrounding areas informed of various happenings of public interest. Proceeds from the event went to benefit the "Collier Comes Together Disaster Relief Fund", through the Community Foundation, in partnership with the United Way.